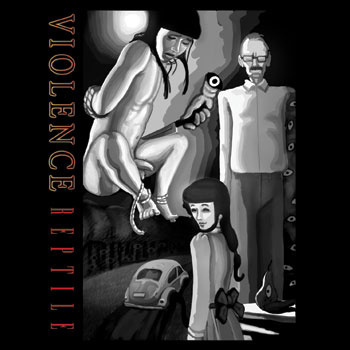 The real violence in this short, primitive but awesome album is the violence of musical genres crushed together in order to create, what? I am not really sure. This reptilian odyssey begins with an apocalyptic chant over what is born as minimal techno beat and later evolves into a more industrial complex of intense hammering percussion. Just when I thought I have figured this album up from the first track, the next tracks surprise me with urban hiphop that connects beautifully with what I have just heard. Then, from the upbeats, Violence takes us deep into underground howling of dark illbient and old synthesizers that build together a mighty witch house of crazed shrieks and rough samples. The longest part of this album, ‘A trace of water’, emerges as a heavenly space of clarity and soft beauty which is mirrored backwards in the short track ‘Heaven’, who dives into the ugly, muddy waters of black metal. Everything feels home made, everything feels real.